00:00 A selection of reels from fiddle player Katie Boyle from Glasgow, Scotland on the Comhaltas Concert Tour of North America in October 2007. The reels are “McCahill’s” and “The Flood on the Road to Glenties”. 02:21 Harpist with the Comhaltas Concert Tour of North America in Oct 2007, Nadia Markey from Co. Monaghan plays an O’Carolan composition, “Bridget Cruise” followed by “Mc Hugh’s Jig”. 04:20 Moving to the Senior Céilí Bands competition at Fleadh Cheoil na hÉireann 2007, two reels from the Innisfree Céilí Band of Sligo, who took second place (having taken 3rd place in 2006). The reels are: “Fergal O’Gara” and “Trim the Velvet”. 09:40 All-Ireland Senior Céilí Band champions for 2007, the Allow Céilí Band play a selection of jigs: “The Shores of Lough Gowna” and “Willie Coleman’s”. The Allow took second place in 2006. 12:04 Taking 3rd place in the Senior Céilí Bands competition 2007, the Tribes Céilí Band from Co. Galway play the 3-part “Ballyoran Hornpipe”, which was composed by Seán Ryan and is this week’s tutorial. 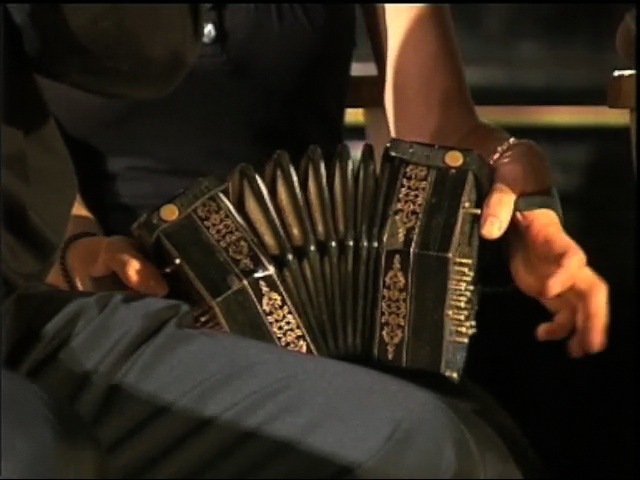 14:31 A lively street session led by piano accordionist Karen Tweed at Fleadh Cheoil na hÉireann 2007 in Tullamore, Co. Offaly. The last jig, a Carolan composition, “Planxty Browne”, is often danced in slower tempo as a solo set dance. 17:28 A selection of jigs: “McHugh’s” and a dance version of the song “Na Ceannabháin Bhána” played by four of the sixty master tutors at Scoil Éigse at Fleadh Cheoil na hÉireann 2007. The five-day school is an integral part of the Fleadh for many decades now and is attended by over 700 young musicians from all over the world.